Welcome to the Valentine’s Day 2012 edition of the 7-Kicks list. 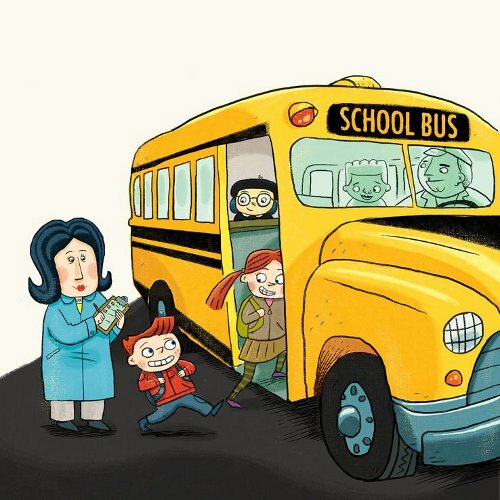 One of my favorite things in all of PictureBook-dom is when Kara LaReau and Scott Magoon join forces and make books together. 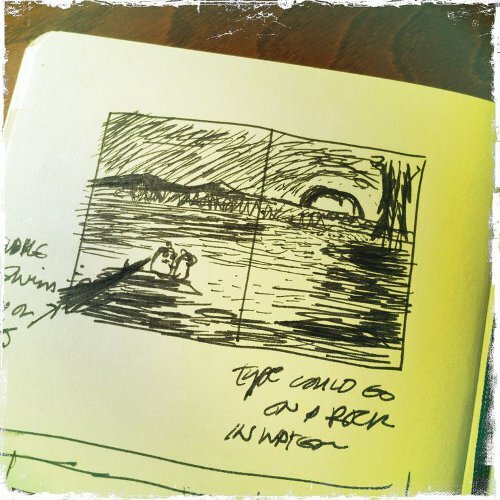 Today, both Scott and Kara are visiting to share images and early sketches from the two most recent books on which they collaborated, and they’re also here to say a bit about these books, their work together, and what’s next for each of them. 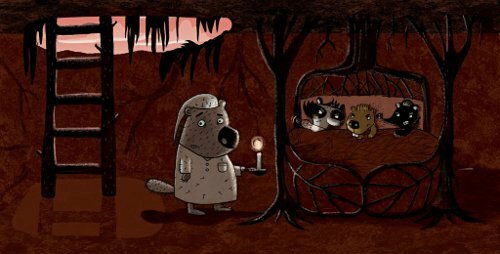 Their very most recent picture book, Mr. Prickles (pictured here)—what Publishers Weekly called a “tale of misfits” (aw, I have a soft spot for misfits)—was released at the tail end of last year (from Roaring Brook), and it’s the “quill-fated love story” of two porcupines. Porcupines are “very hard to get close to,” so poor Mr. Prickles has a difficult time making friends. He tries, he fails, he gets lonely, and he even gets prickly-angry. (The other woodland creatures are downright mean to him.) That is, till he meets Miss Pointypants. And then (just in time for your Valentine’s-Day read), love is in the air. As you are wont to get with a LaReau/Magoon collaboration, there’s humor, emotion, and lots of style. It’s also got a pulsing heart at its center without being overly schmaltzy about it. 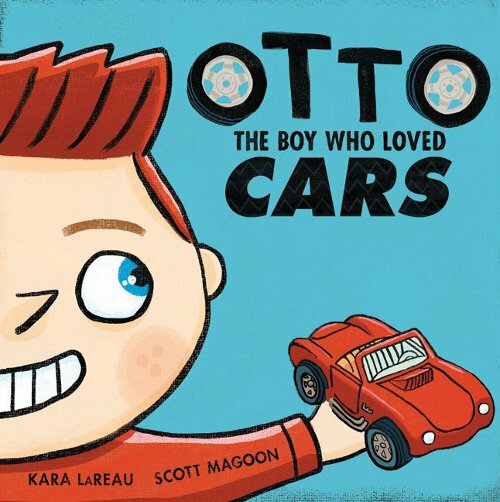 And, if you missed it last summer, don’t forget to take a look at their other collaboration, Otto: The Boy Who Loved Cars, also released by Roaring Brook (but in June of last year). “Car lovers in particular will enjoy Otto’s tale,” wrote the Bulletin of the Center for Children’s Books, “but any kid who has ever dreamed of being something else will find lots of heart and humor in Otto’s story of new perspective.” A young boy named Otto, as you can guess from this book’s sub-title, loves cars — “above all places and things (and even most people).” One night, somehow, he becomes a car (or so he thinks) and, to his surprise, his family and friends don’t even notice the difference. He powers on with his obsession, annoying everyone in sight, till eventually he breaks down: “You’ve been living and breathing one thing for too long,” his mother tells him. 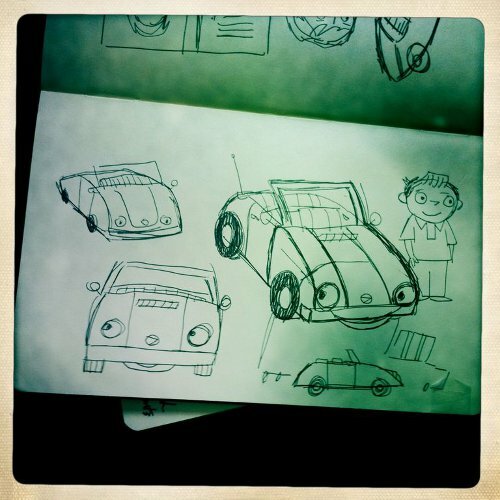 Kara: This story was inspired by my husband, who is a car fanatic. Unlike Otto, he does have varied interests, but he can get pretty obsessive about all things automotive! I couldn’t help seeing the potential for a story about obsession taken to an extreme. 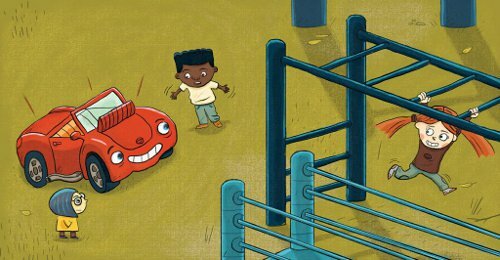 And as I created the story, the car-related puns just kept coming. You might say the book was a gas to write. Scott: My two sons get completely obsessed with their toys—just like their dad when he was a kid. 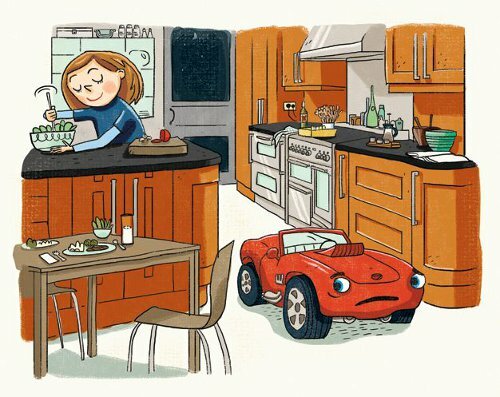 And so when I read Kara’s story about a boy’s sole focus and passion for all things automobile, I knew this story would resonate for many readers. Of course, I loved Kara’s car puns as well; they take the high road. Kara: I’m always interested in the idea that things (and people) aren’t always what they seem — “you can’t judge a book by its cover,” as they say. And I knew I wanted to write a book about a porcupine; the name “Mr. Prickles” had already come to me, so that was a done deal. So I thought about how I might create a character who had a great capacity for love and kindness, but whose outward appearance belied those positive traits. Also, I tapped into my own past prickly social issues — growing up, I was always trying to fit into a certain crowd, even though I never had much in common with those kids. It was only when I started hanging out with people who accepted (and appreciated!) who I really was that I finally found a group of friends that felt right. And we’re still friends to this day. I like to think Mr. Prickles and Miss Pointypants have that kinship. Scott: As it did for me, Mr. Prickles’ struggle is going to ring familiar with the majority of the story’s readers. Most of us have had a longing to fit in at one point or many points in our lives. 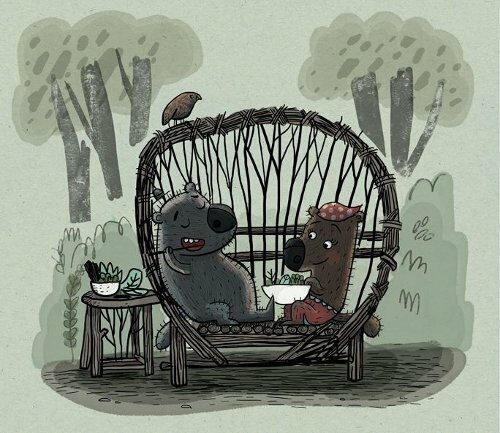 I loved how Mr. Prickles finally does meet a good friend and doesn’t have to sacrifice who or what he is to fit in. 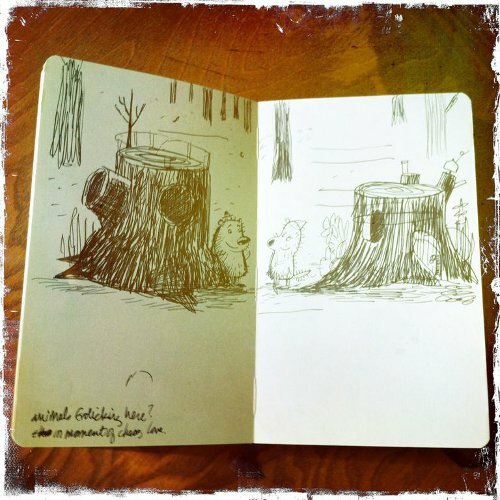 Also, drawing kooky and small woodland creatures in a moody nocturnal forest environment was great fun. 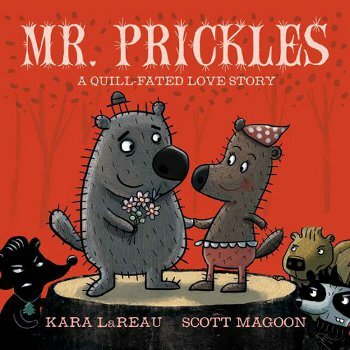 Kara: Otto and Mr. Prickles are the third and fourth books Scott and I have worked on together. We’ve always had a certain simpatico (not unlike a certain pair of porcupines), and it’s only deepened with each book. 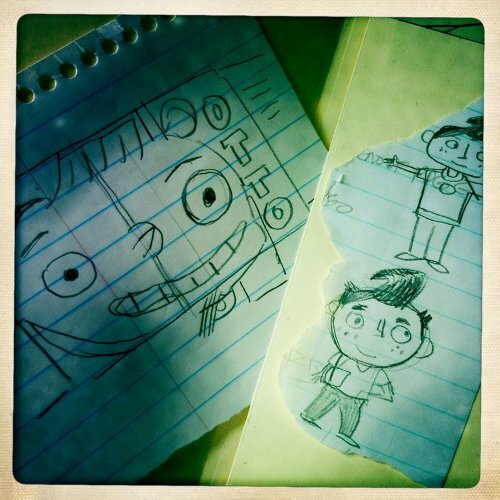 Now I can write a text with Scott in mind, and I think things like “Oh, Magoon is going to have a field day illustrating THIS,” or “I think Scott’s going to have a good laugh here.” I just knew he’d shift into high gear for Otto, and he did. 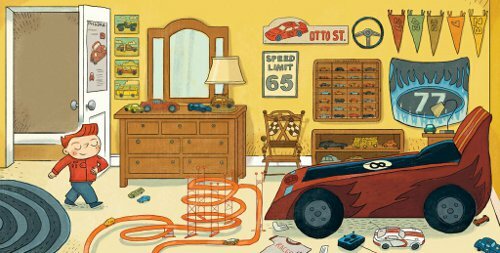 You can see all the little details he added to that world — Mrs. Dodge’s ram-shaped hairdo, the car-shaped bed in Otto’s room (which my husband covets), the punny books (like “Karfka”) on Otto’s shelf. As for Mr. Prickles, I think Scott brought so much to the book, things I didn’t even fully realize when I wrote it. When I saw the art, I was struck by how romantic and cinematic it was; perhaps it’s the combination of the nocturnal setting and the dramatic angles Scott chose. I think Scott tapped into the emotional core of the story — the loneliness and isolation at first, and then the friendship and love and belonging — and brought it to life. And he gave the character of Skunk a necklace made out of a car air-freshener. If that isn’t stinkin’ genius, I don’t know what is! Scott: Kara and I used to collaborate as editor and designer at Candlewick Press years before we began working on our own books as author and illustrator. As I had with Kara herself in those days, I have found a personal connection with each of the protagonists (and some antagonists!) in Kara’s stories. 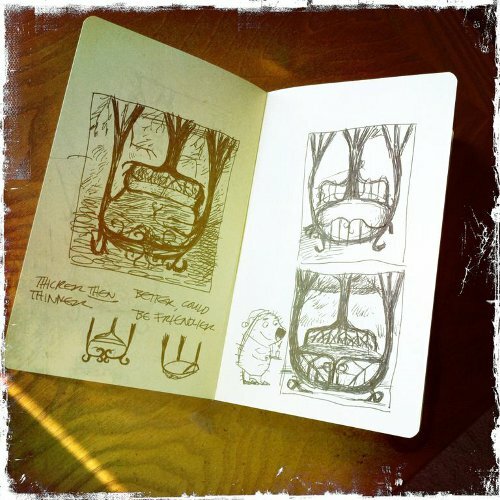 As an artist, that connection keeps me personally engaged and emotionally involved with the drawings I create for these books. Because often I think I know how they feel, I strive to capture that for the book. If you’ve ever read one of Kara’s books you’ve likely found a great deal of heart in her stories — she and I want the reader to connect with that immediately because it will keep them coming back to read the book. From there, I add nutty little details like the ones Kara just mentioned. The skunk had to have an air freshener, because who would want to hang out with a skunk over a porcupine unless the skunk smelled better?! I remember reading the Otto and Prickles manuscripts for the first time and thinking, “man, these are GOOD.” For me, that has to happen on the first reading of the text if I’m going to illustrate it. We don’t set out to do offbeat stories for their own sake. At their core they are substantial and meaningful parables, but Kara angles them to unfold unexpectedly — very unexpectedly in a couple of cases, as with Ugly Fish and Rabbit & Squirrel, for instance. Kara: I just finished the text for a picture book for Disney, called Mind Your Manners. It will be illustrated by an incredible artist named Lorelay Bove, and it should be coming out in 2013. I’m also about to send out several picture book texts on submission, and I’m putting the finishing touches on a middle-grade novel, which I hope to send out this spring. I’ve retired from editing and am writing full-time now, so the creative floodgates are open! OTTO. Copyright © 2011 by Kara LaReau. 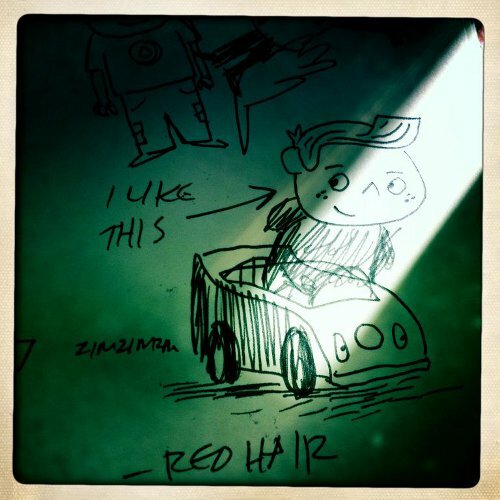 Illustrations © 2011 by Scott Magoon. Published by Roaring Brook Press (a Neal Porter Book), an imprint of Macmillan, New York. All images reproduced by permission of Scott Magoon. 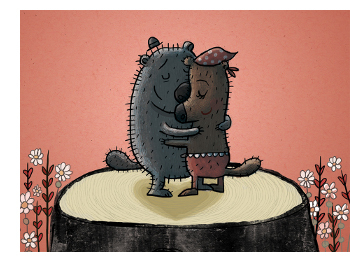 MR. PRICKLES: A QUILL-FATED LOVE STORY. Copyright © 2012 by Kara LaReau. 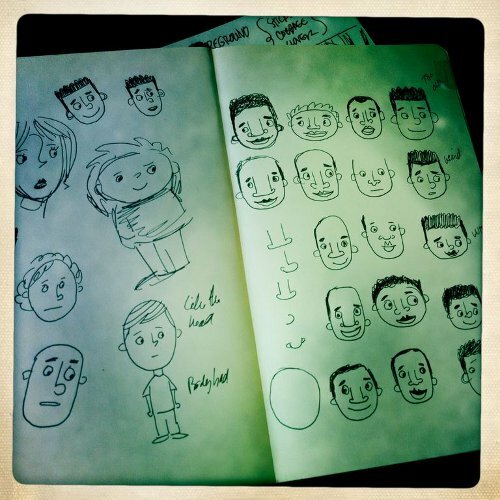 Illustrations © 2012 by Scott Magoon. Published by Roaring Brook Press (a Neal Porter Book), an imprint of Macmillan, New York. All images reproduced by permission of Scott Magoon. 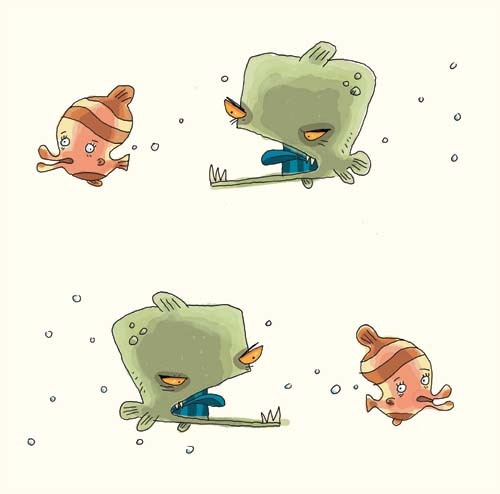 Illustration from Ugly Fish reprinted from this 2008 interview with Scott Magoon. 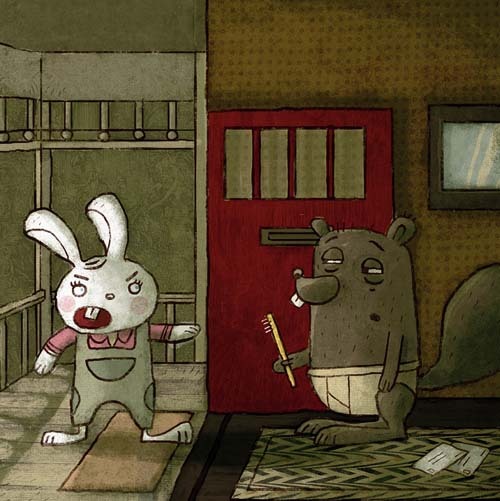 Illustration from Rabbit & Squirrel reprinted from this 2008 7-Imp post. Alfred (below) is © 2009 by Matt Phelan. Note for any new readers: 7-Imp’s 7 Kicks is a weekly meeting ground for taking some time to reflect on Seven(ish) Exceptionally Fabulous, Beautiful, Interesting, Hilarious, or Otherwise Positive Noteworthy Things from the past week, whether book-related or not, that happened to you. Er, hi. Alfred here. Jules is traveling right now and is actually not even online today, though she did manage to compose the top part of this post before she left. She felt strongly about having me share this post with you today, since there is no way, she said, that she’d ditch her “dear kickers” on any Sunday ever. I swear. Always trompin’ around here in her PJs and with her COFFEE and talking about KICKERS. Honestly. But she does make good, strong coffee. And she laughs at my wicked knock-knock jokes. So there you go. She won’t be around for a couple more days to respond, but she hopes you leave your kicks. Or…you can leave wicked knock-knock jokes, if you’re so inclined, but they can’t possibly be better than mine. Ahem. Kara LaReau and Scott Magoon: Hi there! Mr. Prickles looks adorable. Oh my goodness, not only is it fun to say YOUR names aloud together but it’s a hoot to say the names of your characters. Miss Pointypants for the win, as the kids say. Have y’all seen Teddy Bear the “talking” porcupine on YouTube? If not, click here. 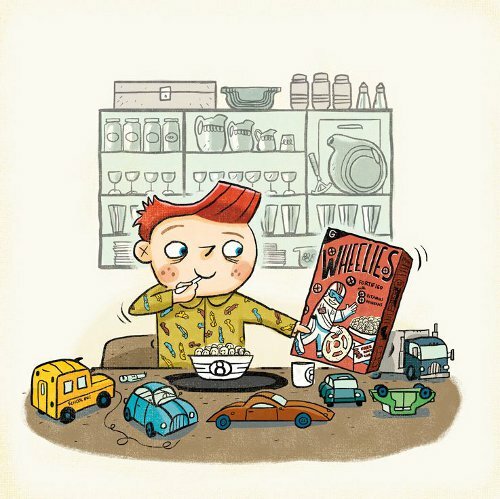 Also, the Wheelies cereal reminds me of wheel-shaped pasta, which I love. Squishy and tasty carbs ahoy! 1) Being offered a role I’ve always wanted to play – I’m going to be Dinah in a reading of The Philadelphia Story! What a delightful duo and I have two more books to enjoy! Their word play and pics are so puny I am still grinning. 1. Going through my 92 year old Mom’s book collection and discovering autographed copies of Eric Carle, Tomie DePaola, Jose Aruego and Pat Hutchins books. 3. Coming home on my lunch hour to find in my mailbox an autographed copy of Roland Smith’s newest title–I won! 7. Walking with my dog Xena and seeing the world through her eyes. Jules, I’m back! I have missed kicking. I hope you have an amazing time in Bologna. Little Willow, I still want to watch you perform one day! Margie, wow. I dunno if any ody can beat your kicks this week. 3. Business ideas that make so much sense and seem so natural that you owner why you didn’t think of them much earlier. 6. Generous help from others when you didn’t even ask for it. 7. Getting back on track with my MA thesis. Sigh with the autocorrect. That was supposed to be *anybody and *wonder. Kara and Scott — great team! Thanks, Jules. There’s a state reservation in Sutton, Massachusetts, where my wife and I have hiked in the summer and fall. I’ve never been there in winter, but I imagine it would be a dolorous place, morosely beautiful. Out over a jagged crag. Of stone and petrified sand. Ooh, ooh me wants these books. My husband is so Otto. Jules, enjoy your trip! Love your butler. LW: congrats on the role! Margie: so cool about the books your discovering at your mom’s. Tarie:so glad to see you back. 2. The Cybils announcement on Tuesday. 4. The Nerdy Book Club Valentine post with pics of TBR piles. 5. Walking my dog yesterday and seeing signs of spring. 6. Listening to my friend’s blues band. 7. “Pair Share” book grant books ordered. What an awesome interview! Loved to hear that they worked together as editor and designer beforehand. Congratulations Kare and Scott, I completely agree with Jules. Power team! Alfred you are doing a great job! Hope that arm doesn’t get tired. 1. Read stories to children yesterday at my favortie childrens boks shop ” Nimmersatt”. A Sick day for Amos McGee, Little Beauty,Big Rabbit’s Bad Mood, Leonardo and the Terrible Monster and “There’s a bird on your head” We made bird’s nests out of salt dough and easter grass. I felt so nervous at first but it went so well and I am telling you this because your blog is such an inspiration. 2. Went ice skating on a frozen pond and didn’t fall., Here in Berlin the canals and ponds and lakes are frozen solid and everybody is out skating. 3.Rediscovered Mrs. Pepperpot illustrated by Bjorn Berg and written by Alf Proysen. Hilarious! 4. discovered the blog 32 pages. I can’t always access it but when I do it’s heaven. 5. made chicken soup inspired by “Oma and Bella”http://www.facebook.com/pages/OMA-BELLA-THE-MOVIE/102515933188717?sk=info . Made a batch for my sick girl. 6. Henning Mankell 7. Adler-Olsen Can’t wait to here your report from your journey! 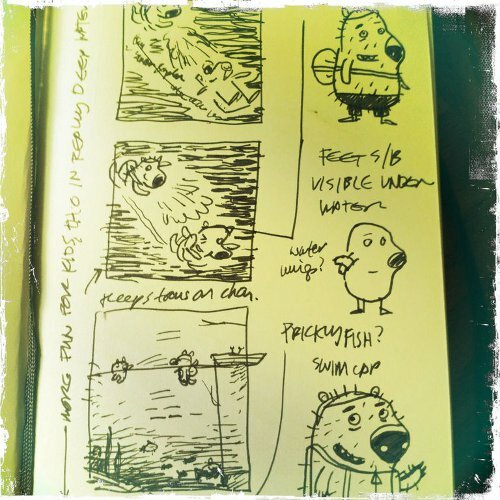 Mr. Prickles makes me smile a lot, and I love seeing some of the notes and sketches that were part of its way. And so many things to smile about here, too: autographed book collections, peanut butter lattes (really?! ), signs of spring, Purgatory chasm poetry, auditions and dream roles, and Jules traveling, sure you’ll bring back treasures. Thank you, everyone! Also, Mr. Prinkle’s very stylish bathing cap made me laugh. I agree with Jeannine, lots of smile-worthy kicks. Steven – a hiking trail called “Fat Man’s Misery”? ha. lisa – skating in Berlin. 1. Guest at an inspired Valentine party last evening w/interesting company, chocolate-dipped strawberries and parlor-room performance by professional opera singers. How voices can fill a room! 2. the inklings of a new story. Steven, Jone, and Denise: “Fat Man’s Misery”! “Winter’s indifferent air”! Denise: Sounds like a really nice party! Jeannine: The peanut butter lattes are so good! Lisa: Ooohhh, now I want to do some arts and crafts with kids too. Jone: I’m excited about the Cybils winners too! 5) The giggles of my friend’s 6 month old. 6) The giggles of another friend’s 11 month old. 7) Baking chocolate chip banana muffins. Scott: Your pictures make me smile the way I do when I’m hanging out with George and Martha (or any James Marshall character.) What a delight. The synergistic effect of your talents seems magical and I can’t wait to get my hands on Mr. Prickles and Otto! 1. Picked up ‘Extra Yarn’! 5. 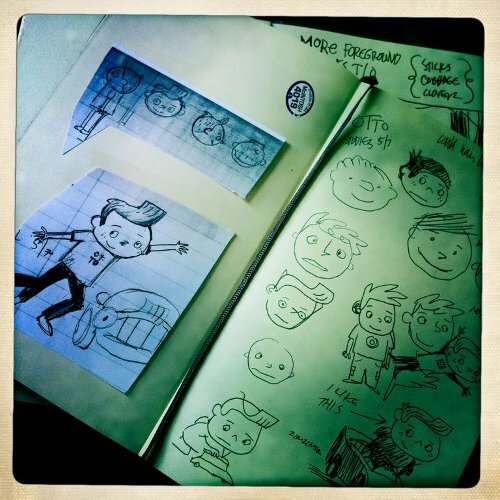 Almost finished creating first animated book trailer… almost! Well done, Kara & Scott! You two make a terrific team! Welcome back Jules. Can’t wait to see these books! 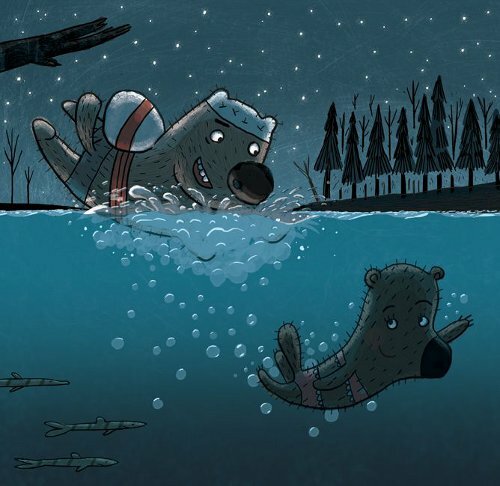 I love the humor and the illos are so fun! 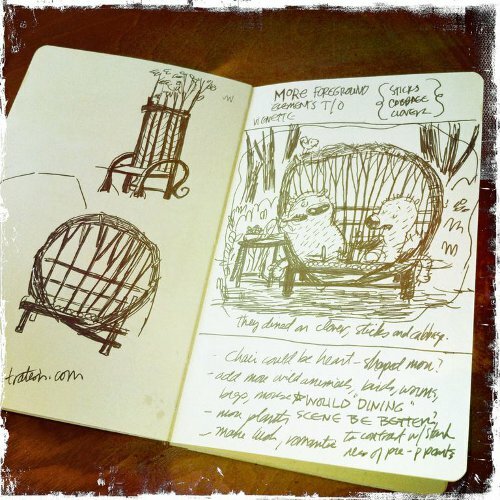 So glad you showed the sketches…it helps to see those and I love peeping into those sketch books. 1. Watching sweet husband make valentine pancakes for our 3 girls. 3. Seeing daughter make origami boxes for all her valentines in her class. She’s a little obsessive about origami right now…just like Otto is with his cars. WOW, thanks to you all for visiting when I wasn’t even around to be happy hostess. Trying to get caught up, now that I’m back in town. More soon! XO to you all. Thanks everyone for making a point to leave such kind words and thanks Jules for taking the time to meet with Kara and me. Always a pleasure being here. Little Willow: Congrats on Dinah! Very exciting. Margie: Dark chocolate cream cheese EXISTS? Wow. Also, how is The One and Only Ivan thus far? Tarie: HI! Continued good luck with the thesis, and oooh, your business opportunities sound really enticing. … Also, I’ve never in my life had a peanut butter latte and really must fix that. Steven, thanks for the poem. Winter’s indifferent air. YES. Jone, seeing the Cybils announcements was exciting. I figured I was catching it late, but I guess I actually caught it on the day it was announced. Lisa, Alfred did complain about his tired arm. Always grumbling. … Hope your girl is feeling better? Thanks for the nice comment about inspiration. So glad the story time went well. That sounds very fun. Denise: OOH, Chime. I wanna read it, too. Is it just great? That party sounds like it was a ton of fun. I can say I’ve never been in the same room with opera singers, belting it out. Hi, Jen. Isn’t Hugo wonderful? I get quietly grumbly when I read bad reviews. I thought it was outstanding … Good luck with that trailer. Lori, I’m actually jealous you’re reading Dear Genius for the first time. Jinx made it required reading in grad school, and I’ll always remember falling in love with that book. Kara and Scott: Thanks again for visiting.